Existing acoustic system (as) furniture type mostly rather cumbersome and expensive. To use them when testing and setting the audio uncomfortable. 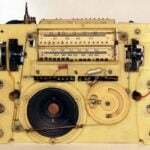 And in ordinary surroundings while listening to the radio and music are often given preference more simple and accessible to speakers of small capacity, including homemade, produced from scrap materials. 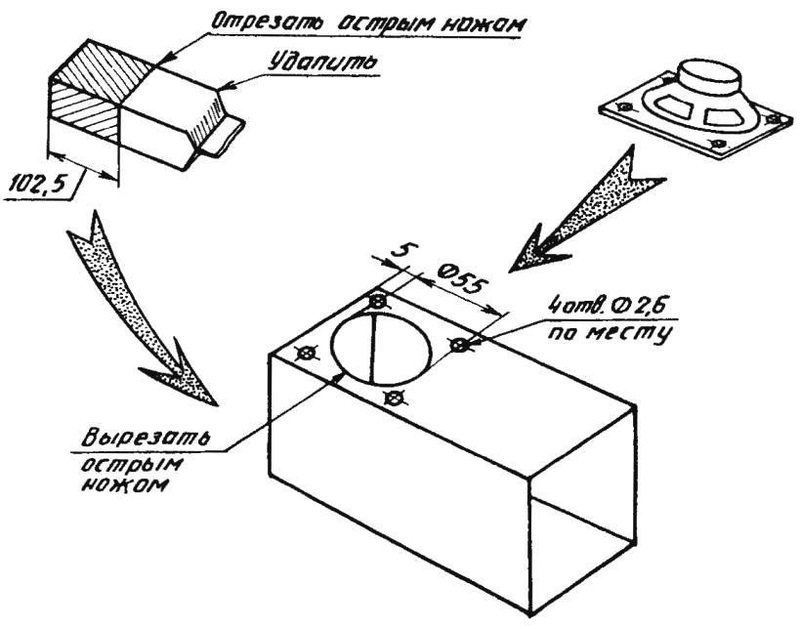 I, for example, in experiments with the amplifier of sound frequency executed on the chip К174ХА10 was initially only one dynamic head (DG) type-0.25 GD-19. Lying on the table, she was quiet and expressionless. Next on the side were “beheaded” paper packaging TETRAPAK of milk (in such box-shaped “boxes” hams, including me, usually store small parts). Clearing off your Desk of all unnecessary, I accidentally put the speaker on the box with the diffuser down. Naturally, zvukovaja dynamics, received a paper rooroobear cavity has increased. And when I cut in the wall of the packaging opening for the audio stream of the diffuser, I got… a sound column in haste. For use in stationary Amateur radio audio equipment such makeshift speaker system it is only necessary to secure speaker with screws or simply glued. The back side of the dynamic head can be closed light decorative mesh, turning it into the funnel. The same mesh can be glued with the front side of the speaker (the open side of the package). Any TETRA packaging has an internal plastic coating. In our case it will serve as a damper (a damper, damping) of vibrations, perceived as an unpleasant rattle, and at the same time, will contribute to the small attenuation of the acoustic signal inside the speaker (of course, if a paper box is not wrinkled). The dips of the amplitude-frequency characteristic (AFC) of the resulting system can be mitigated by hanging “bell” on the back dynamics of the same carton TETRAPAK. Moreover, the height of the last as parameters of the suspension, it is easy to clarify by submitting to the amplifier input signal of the frequency which was observed the most profound failure of the AFC. In stereomerini we should make a two speaker system. It is possible to create an active speaker (with its amplifier is placed at the closed end of a box-shaped buildings). But to improve the low frequency reproduction, the pipe as it is desirable to put on the table (while at work and turn on the tabletop). For further experiments we use not one, but two paper packs, glued together so that the holes for the speaker cone coincide. In the top cavities install, as before, speaker. Wires to it pass through the hole pierced in one of the lower corners of the upper box. The coil on the speaker plug to the audio amplifier, run the music program and… make sure that the music was worse than in previous versions with one packing. This is understandable: the front and rear sides of the diffuser are vukovarsirmium volumes. Antiphase radiation from the open ends of the mouthpieces-packaging reach to the listener almost at the same time, with the mutual cancellation of each other. However, the music program will still be perceived (due to the small difference of paths, as well as some scattering and reflection of sound waves from the surrounding objects), but in much weakened form, with a ragged frequency response. To increase the volume the speakers sound it is necessary to delay one of the antiphase signals for a short time (until the phase of the signal is rotated by 180°) to the radiation emanating from the open ends of both mouthpieces have become in-phase. However, the music program consists of sounds of different frequencies. Turn time 180° phase for each will be different. So, when using conventional narrow-band phase inverter (namely the so-called device that delays the phase of the signal) will change the frequency response of the acoustic system, since one frequency be amplified and others suppressed. But the volume on the weak parts of audiozapisey can be improved by resonating the properties of the mouthpieces and a special cavity with a correction of its position in vukovarsirmium the volume of the speaker system. The latter device will be the phase inverter, only unusual with adjustable delay time, and hence with the operational adjustment of the frequency response. The timbre of the sound such as can be set as desired. However, there will be limitations, due to the design. As the resonator is the best suited aluminum cans 0.33-liter (from drinks). The metal cover she carefully removed with a sharp knife. The remaining capacity resonator installed inside the lower horn speakers (the neck of the diffuser). To hold the resonator in position and damping on the inner side of the paper side walls of the resulting bonded phase inverter cushioning strips of felt, sponge rubber or, in extreme cases, foam. Telescoping and ndwiga fazoinvertor in the resonator cavity, adjust the frequency response of a speaker system. The best sound in the throat position of the resonator have a hole cut at the speaker cone, is recorded as working. Thus, the speakers use non-delayed radiation of the back side of the diffuser, and sound waves excited by its front face and passing through frequency-dependent phase inverter, with a resonator. Although the frequency response of this system contains a lot of peaks and valleys, but irregularity get it small enough and can be optimized by the listener during playback of a particular track. Sound vibrations from the front side of the speaker cone fall inside thin-walled aluminum cans resonator. Due to the design characteristics of the last (tapering neck and a bottom part, the contact with the side walls of the lower “Tetra Pak carton” packing) there are all kinds of reradiation. A complex pattern of interaction complements the bottom that plays the upper frequencies of audiozapisey the role of another (hard) diffuser. In addition, the location of the banks of the resonator in the bottom box may vary. Then there are all the conditions for adjustment of the path and amplitude of oscillations of detainees, and hence the real possibility for adjusting the frequency response of this speaker system. Assembled from two paper packaging TETRA Pak and regulated as you on the outside to “improve” textured material, and zvukoizoliruyuschie holes thinned draping decorative fabric or lightweight plastic netting. In the manufacture of technologically similar well as from more traditional materials, allowing to increase their size (and ensuring better reproduction of low frequencies audiozapisey), followed by the body from within to paste over with plastic wrap in one layer. This will significantly reduce the spark knock and rattles inherent in thin-walled acoustic systems. In conclusion, a few words about the equipment in the complex which was used to study the possibilities of paper “petropalovski” AC. From the beginning I wanted all the tests as a cleaner in the evaluation of sound quality of acoustic systems are not affected by distortions inherent in consumer electronics (for example, route RECORD / PLAYBACK some of the most common tape). However, I knew that the amplifier on the basis of the chip К174ХА10 practically devoid of this drawback. Moreover, developing the output power of 1 W, this device is very compactly mounted on the end of the same boxes TETRA Pak will be able to work reliably at relatively low (3-15) the power supply voltage. And to the music program reproduced by this amplifier, could not tire of monotony, I decided to apply to the input signal from the detector… receiver (to collect this will not be difficult even for the student). The results were satisfied. For those who decide to replicate my design quality of the receiver of direct amplification, provide the necessary data. Used operating range — DV. 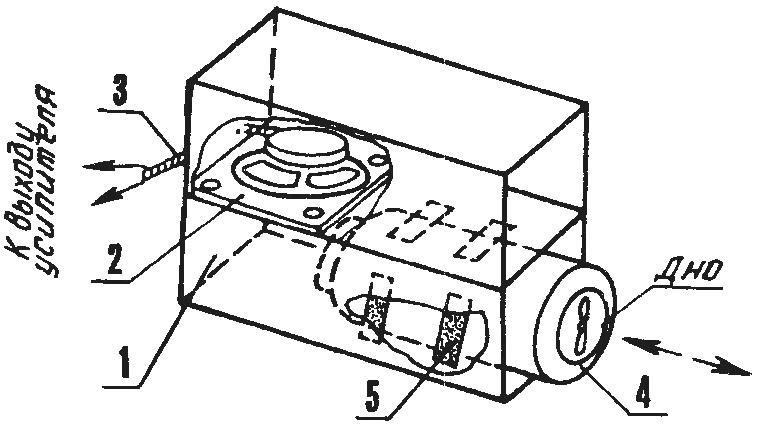 The takeup reel oscillating circuit is wound on a paper frame with a diameter of 10 mm and contains 180 turns of wire ПЭВ2-0.08. 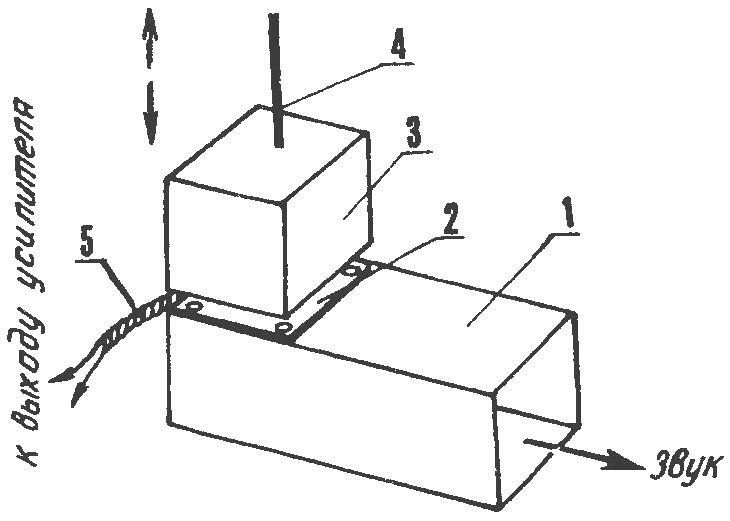 A variable capacitor (variable capacitor) is one section of the block KPE. The rest of the details (and for the design needs a little) — according to the circuit diagram. 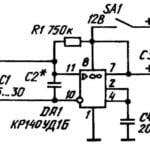 For the reception of programs in range of SV no alterations in this product is not required (with the exception of the capacitor C2 whose capacitance at frequency 1 MHz — 20 to 30 pF). When you connect a good outside antenna and good grounding this device will SPIRA to put to the speaker system a variety of programs, including much music.